Posted on August 15, 2010 under Travel. We began our journey to Kargil with a new driver. Due to the problems in Srinagar our travel agent arranged for a driver from Srinagar so as to avoid any trouble along the way. While he was certain that we would reach Kargil without incident, the Kargil-Srinagar journey was what was hanging under a cloud of uncertainty. 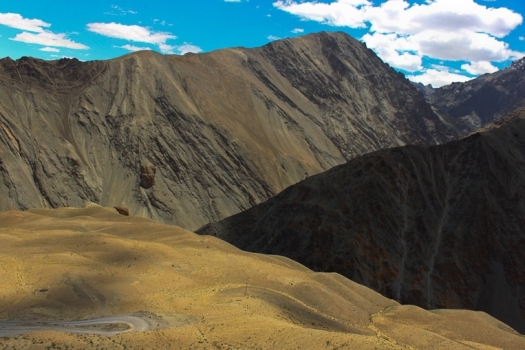 The road to Kargil was breathtaking. Along the way we passed the moonscapes of Lamayuru, fields, desolate mountains, scrubland and quaint little villages. At around 4:00 in the evening we finally arrived at Kargil and checked into our hotel. After resting for a bit, we went out to explore the marketplace. I managed to find some excellent apricots and walnuts on sale in the market (Should have bought more though…). We also bought more provisions for our journey the next day. After the “shopping” we went back to the hotel to turn in early since we needed to leave at the crack of dawn for Srinagar.